Olives have become more heavily cultivated in the United States in recent years due to their increasing popularity, specifically for the health benefits of the fruit’s oil. This increasing demand and resulting swell in production has also brought about increased incidence of olive knot. 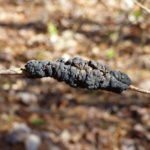 What is olive knot and what other olive knot disease info might be helpful in treating olive knot? Read on to learn more. Olive knot (Olea europaea) is a disease caused by the pathogen Pseudomonas savastanoi. This pathogen is known as an epiphyte. ‘Epi’ is from the Greek, meaning ‘upon’ while ‘phyte’ means ‘upon the plant.’ Thus, this pathogen thrives on the rough bark of the twigs rather than the olive’s leaves. As the name suggests, olive knot presents itself as galls or “knots” at infection sites, usually but not always, at leaf nodes. Pruning or other wounds can also open the plant up for infection by the bacterium and freeze damage increases the disease’s severity. When it rains, the galls ooze infectious bacterial goo that can be transmitted to uninfected plants. Infection develops in the spring and early summer and produces galls ½ to 2 inches within 10-14 days. All cultivars of olive are susceptible to olive knot, but only the above portions of the tree are affected. Severity of the infection varies from cultivar to cultivar, but young, one-year-old plants are much more susceptible than older olives. While this disease has been witnessed worldwide throughout olive growing regions, the increase in cultivation, especially in northern California, has made it a more common and serious threat. 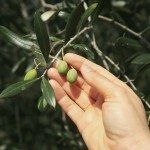 Northern California’s mild climate and prevalent rainfall combined with mechanized cultural practices on large olive plantings has become the perfect storm and thrust the disease into the forefront as one of the more potentially costly diseases of the olive. The galls girdle and kill off afflicted twigs which, in turn, reduces yield and affects fruit size and quality. For the home olive grower, while the disease isn’t fiscally damaging, the resulting galls are unsightly and detract from the beauty of the landscape. Bacteria survive in the knots and are then spread throughout the year, making control of olive knot disease especially difficult. So how do you go about treating olive knot? Is There an Olive Knot Treatment? As mentioned, control of olive knot disease is difficult. If the olive already has olive knot, carefully prune out the afflicted twigs and branches during the dry season with sanitized shears. Disinfect them every so often as you prune to mitigate the possibility of spreading the infection. Combine the above olive knot treatment with an application of copper containing bactericides to leaf scars and other injuries to minimize the possibility of contamination. A minimum of two applications is needed, one in the fall and one in the spring.